Most of my readers will know that I installed a solar panel this summer and ran wires and lights too. When I did so a few of you cautioned that the 12 volt system would not meet my needs. So far, not much has changed, every time I turn on the switch there is a ray of clear, free light that pops on. The only let down I had, is that I can’t charge my drill. This remains the only drawback of going with a small 12 volt system in my particular off grid situation. The stand that I built for it seems to be working really well too. It keeps the panel off the ground and it is also heavy enough to stay on the ground even with the huge winter winds that we experience here on the escarpment. Yes, I agree! It would! I’m so glad for you! I never thought in a million I would find someone so similar to myself. I am an avid motorbiker, newly converted vegan (which never in my life would I imagine would happen), and have recently taken an interest in environmental sustainability and….tiny homes. Additionally I may be moving to Eastern Ontario for work. Talking to you would be invaluable to me. Can you please email me and perhaps we can swap numbers. I too am trying to get around the bureaucracy of building a tiny home. The red tape is so thick and I could use your expertise! Join my group on facebook and we can chat on there a bit. It certainly sounds like we have much in common! Great! It’s amazing how little electricity we can get by on. How do you find solar during winter?? . I’m an Aussie, in the planning stages on a tiny house. Thinking about solar , but wondering about winter season! While we have never had snow where I live, we do get overcast days, and lots of rain during the winter months! 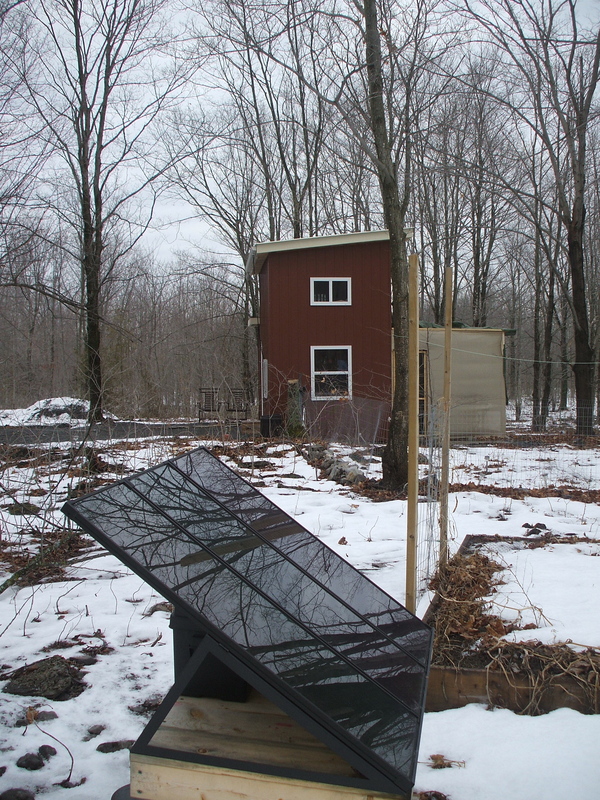 Is the solar electricity enough to get you through during the winter? Thanks Beth! We have quite a lot of sun here in Ontario Canada even when it is cold. My little solar system is just perfect for my needs. I use electricity for lights, charging my phone and computer. I don’t use it for cooking or refrigeration, so my needs are very small. Good luck with your Tiny House! Keep me posted will you?